The Great Exhibitions competition, kindly funded by the Gee bequest, was established in 2012. The competition recognises excellence in public exhibitions that address topics in the history of science, history of technology or history of medicine. There are two categories, one for large exhibitions and one for small exhibitions. The winner of the latter is awarded a financial prize of £300. The BSHS welcome entries from institutions in any country and exhibits may be permanent or temporary. Eligible exhibits must use artefacts or places of some kind and this may include buildings or locations, pictures, instruments, objects and books. 2016: Adler Planetarium, Chicago for What is a Planet? 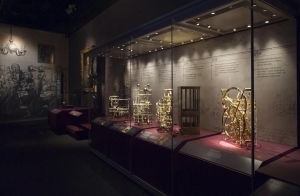 2014: National Maritime Museum, London for Ships, Clocks and Stars: the Quest for Longitude (see image above) and the Collection of Historical Scientific Instruments at Harvard University for Body of Knowledge: A History of Anatomy (in 3 Parts). 2012: Science Museum, London, for Codebreaker: Alan Turing’s Life and Legacy and Royal College of Physicians of London, for Curious Anatomys.